Up until the fourth quarter of Game 2 of the Denver Nuggets' first-round series with the San Antonio Spurs, Jamal Murray had been -- to put it kindly -- not good. 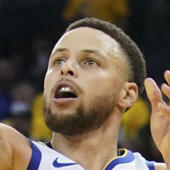 Not only did he shoot 8-of-23 from the field in Game 1, but he also missed a wide-open mid-range jumper with 9.4 seconds left that would have given the Nuggets the lead, then turned the ball over with two seconds left as he tried to race up the floor for a potential game-tying shot. Denver's Game 1 loss wasn't all Murray's fault, but he certainly didn't step up when they needed him. It wasn't going much better in Game 2. In fact, it was going worse, as Murray missed all eight of his shot attempts in the first three quarters. With Murray struggling, and the Spurs doing pretty much whatever they wanted on the offensive end, the Nuggets trailed by as many as 19 points in the middle of the third quarter. At that point, it truly looked like the Spurs would take Game 2 and be up 2-0 heading back home to San Antonio, where they were 32-9 this season. Murray, though, had other ideas. The young guard has always been a bit of a streaky shooter, and for as bad as he was early in this series, he was that good in the fourth quarter. In truth, though, his turnaround may have started at the end of the third quarter, when he got to the free throw line and finally saw the ball go through the net. In any case, he had all the confidence in the world in the fourth quarter, raining in jumper after jumper despite some pretty solid defense from the Spurs. This wasn't a case of the Spurs falling apart and losing track of Murray a bunch of times; this was elite shot-making from Murray. Just look at some of the shots he was knocking down. Fadeaways, off-balance 3s -- it didn't matter what the Spurs did. Murray finished 8-of-9 from the field in the quarter -- equaling the number of shots he made in the previous seven quarters in the series combined -- and scored 21 of his 24 points for the game in the fourth. The Spurs, meanwhile, scored just 23 points as a team in the final 12 minutes. More important than just putting up the numbers, Murray had four scoring possessions down the stretch that either tied the game or gave the Nuggets the lead. The phrase might get overused at times, but Murray truly put the Nuggets on his back in the fourth quarter. After the game, head coach Mike Malone made it clear that he never thought about benching Murray during his mini slump. While he admitted he didn't see Murray's fourth quarter takeover coming, Malone noted that it was important to show his young point guard that he believed in him. "I was going with him. He needs this. This is so important for all of our guys, but especially Jamal. You know, a young player, third year. Even though he was out there struggling, he was trying to play the right way. I didn't foresee the fourth quarter he was going to have, but I knew in my heart he needed to get these minutes. I needed to show him I believed in him. That's powerful. If I pull him -- 'Does coach really believe in me? Does he have my back.' So I had to stay with Jamal make or miss, because he's our guy, and I care about him. He came through in a big way, and never once did I think about pulling him from the lineup." That's an impressive quote from Malone, and sticking with his youngster despite how things were going was an impressive decision as well. It would have been more than understandable if Malone went in another direction with the Nuggets down double-figures and facing a 2-0 series deficit. But he had faith in his young guard, and Murray rewarded him with an epic performance that, at least for now, saved the Nuggets' season.